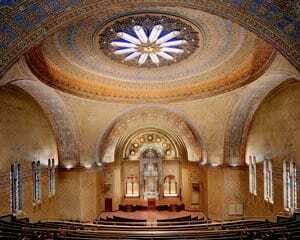 Sacred | John Canning & Co.
John Canning Co. liturgical designers and artists are experts in sacred decoration, restoration, conservation and creative expression. 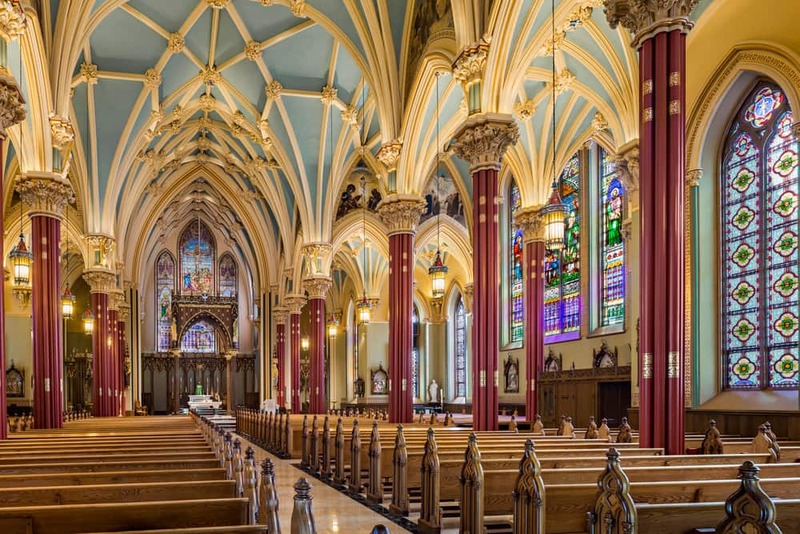 The care and maintenance of historic churches are often the responsibility of the clergy serving the congregation and parish committees designated to help. 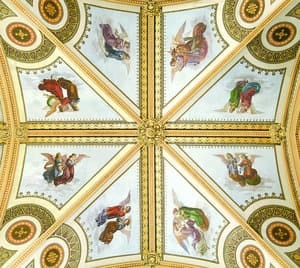 John Canning Co. prefers to work as a partner with these decision-makers when restoring ecclesiastic interior decoration. We created Canning Liturgical Arts to specifically serve those in charge of sacred properties. 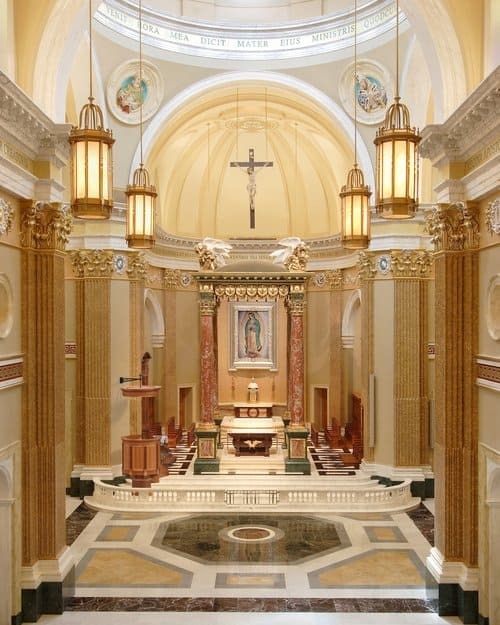 In the hands of Canning Liturgical Arts artists and artisans, common elements of paint, plaster, wood, and stone are elevated to sacred art using traditional decorative paint, finishes, and design. 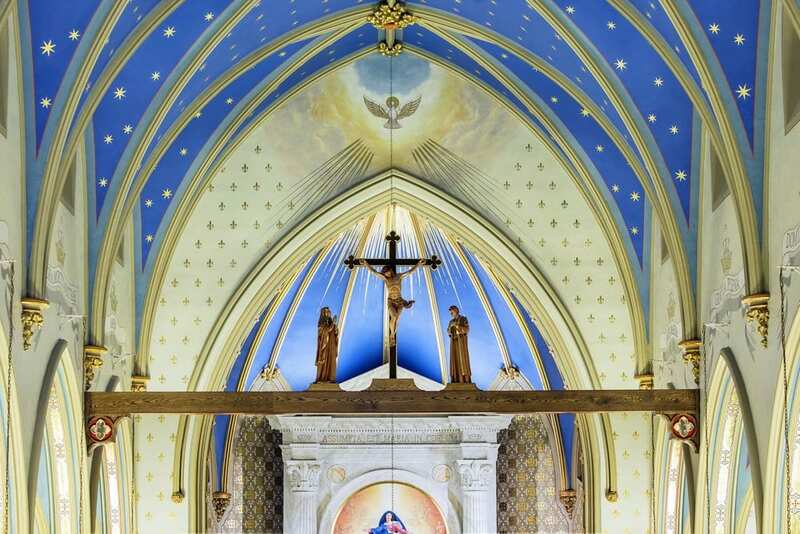 We carefully restored the color palette and design revealed by paint study and scientific analysis is typical of churches dedicated to Marian worship. Our conservation team restored the decorative paintings on acoustic fabric at Rodeph Shalom which required painting and replicating surface patterns. 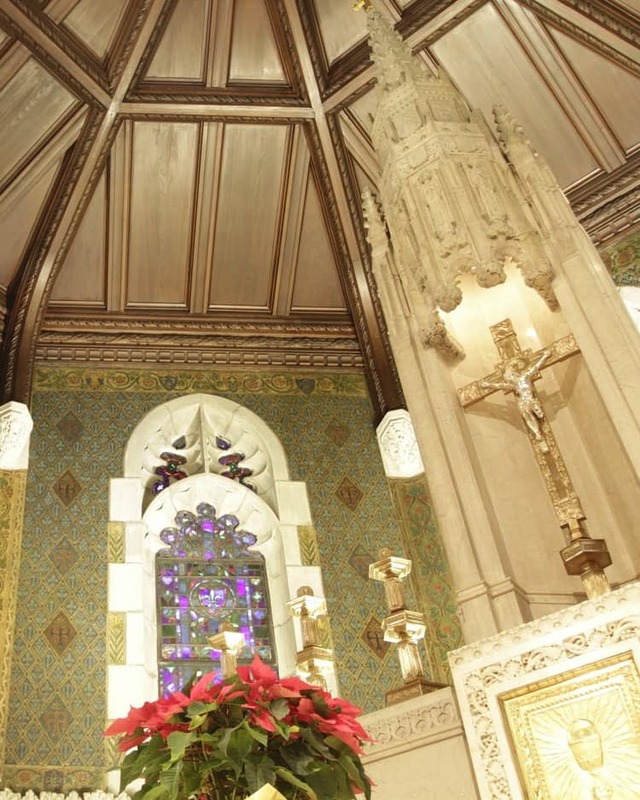 We carefully installed the new Gothic Revival interior design that references Catholic liturgy, traditional iconography, and celebration of Saint Mary. 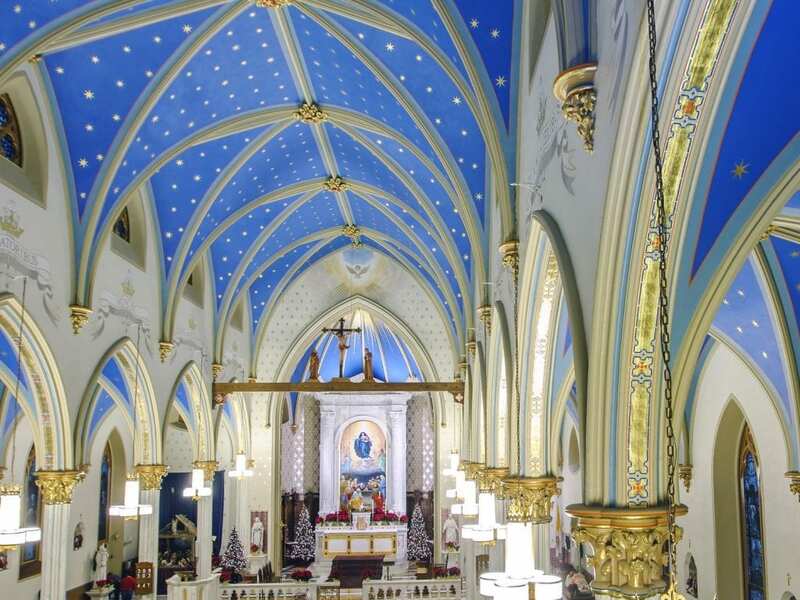 We designed all decorative finishes, including many faux marbles and other stones, gilding, and a dome ceiling feature in the Shrine of Our Lady Guadalupe. 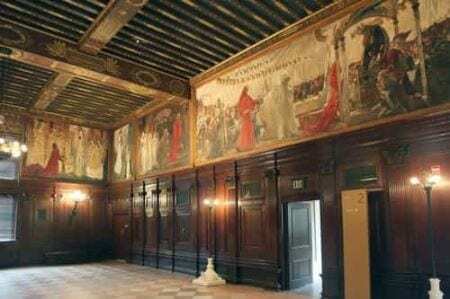 We restored the decorative paintings and murals that had been painted over decades earlier and revealed with historic paint analysis and exposures. The St. Mary’s Chapel restoration involved conservation cleaning without damaging the surface or altering the color of the historic cast stone. We were able to uncovered original colors, patterns, and finishes to conserve 24 murals while restoring Stations of the Cross and the scagliola columns. 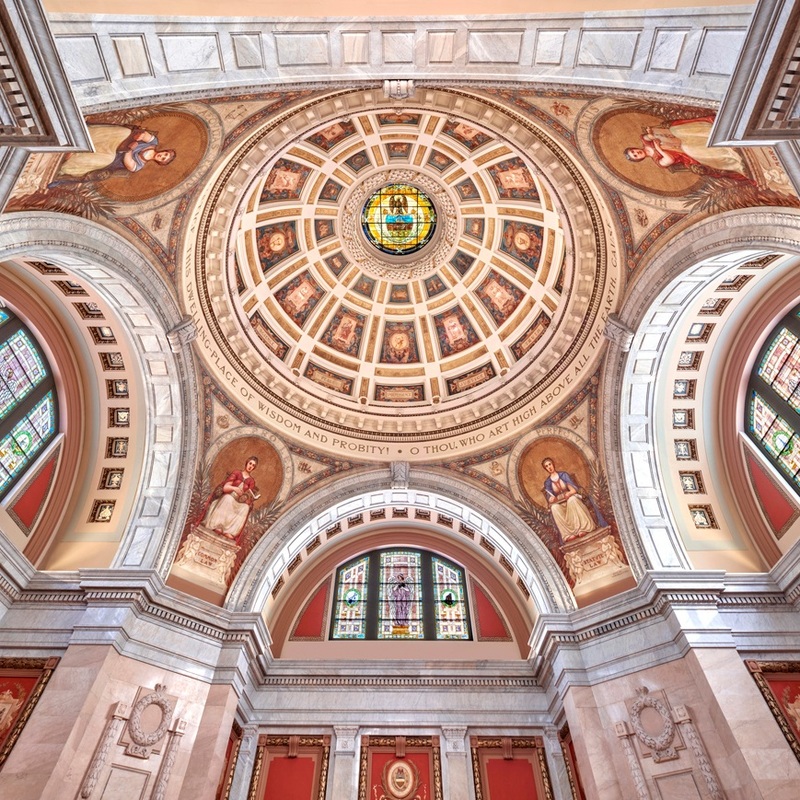 We provided design assistance, which included finishing investigations for the fine and decorative artwork in the Trinity Church’s Central Tower. Our conservation team restored the plasterwork throughout the Colonial Theatre’s auditorium and public spaces, including casting ornamental plaster. 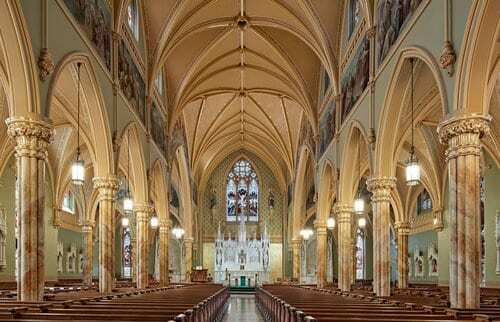 Our skilled team performed a historic paint study and analysis in order to provide an accurate restoration of the intricate designs in Christ Church. 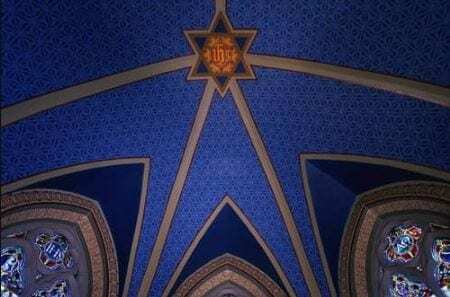 Historic paint analysis uncovered the original church decoration which was restored for 22 fine art murals and a series of simulated stained glass windows. 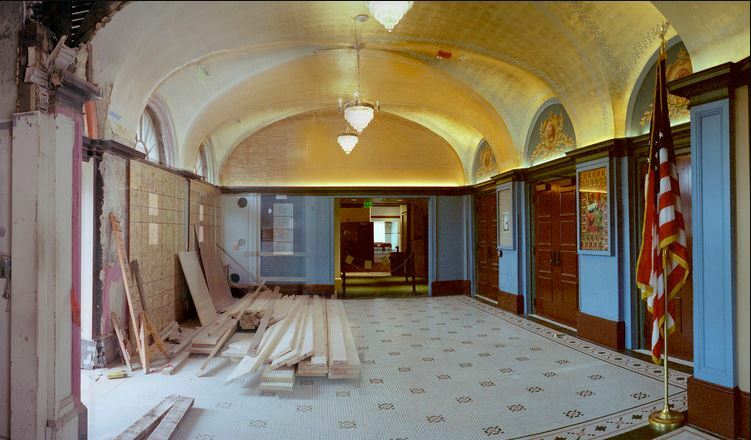 We provided analysis, interpretation, and implementation of historic restoration services at the McKim building at Boston Public Library. 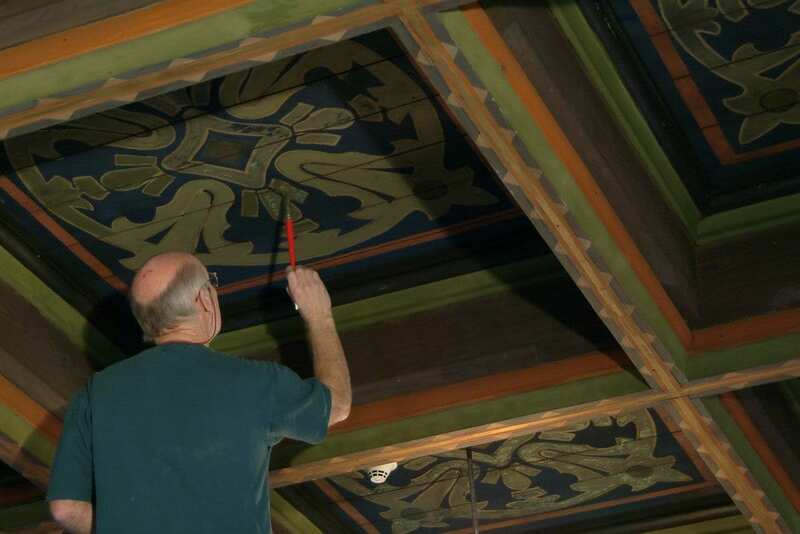 The Canning Co. process of archival research, hands-on investigation, scientific analysis, and interpretation led to the successful restoration of Battell Chapel’s original Victorian-era decorative painting scheme. 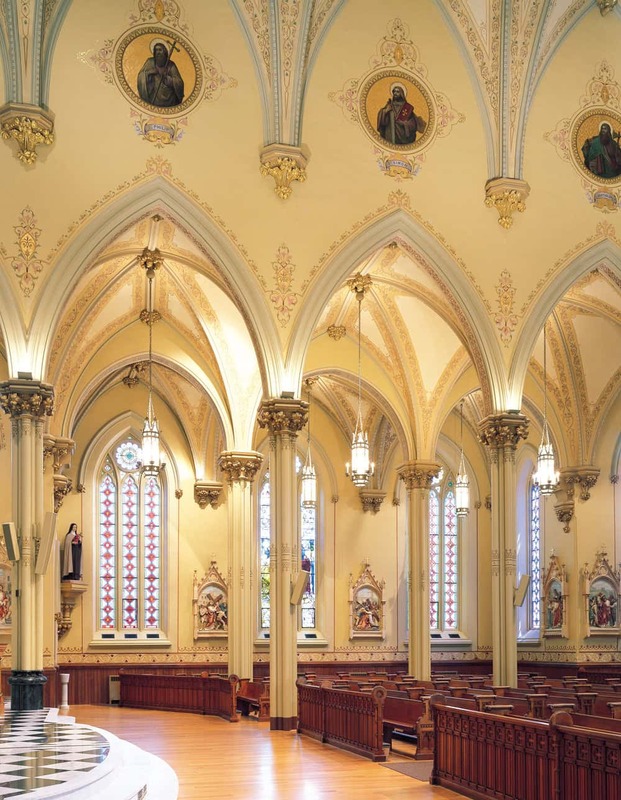 We provided historic restoration and conservation of ornamental plaster and decorative painting, new murals, and complimentary design that reflects the Catholic liturgy, and honors Saint John.